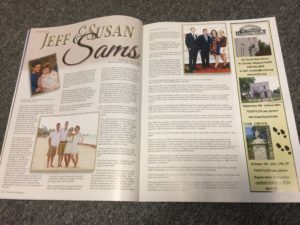 We’ve always known that our fearless leaders, Jeff and Susan Sams, were a great couple, but we think Streetscape Magazine got it right when they named them a Dynamic Duo! Jeff and Susan are featured in the Fall issue of Streetscape Magazine where they discuss their experience as married business owners. It’s not always a walk in the park, but Jeff and Susan lean on each other’s strengths to help balance them out and create a strong, successful team. In this article, you get an inside, behind the scenes look at how Sams Carpet Cleaning got its start, how Jeff and Susan met, and important lessons they’ve learned over their 30+ years in business. And of course, they discuss the importance of being involved in the community and the Sams Family involvement in St. Charles County. We love our St. Charles community and we feel incredibly blessed to be included in Streetscape magazine this month along with other wonderful local St. Charles businesses. You can read the full article in the latest issue, now available! You can pick up a copy at any of THESE locations or check it out online HERE. A big thank you to Amy Armour and Streetscape Magazine for this featured article on Jeff, Susan and Sams Carpet Cleaning and Repairs! Be sure to pick up a copy for yourself today!